For more than a week, Bangladesh has been gripped by mass protests triggered by the death of two children in a traffic accident. The demonstrators, overwhelmingly young people, are demanding that the government take action to improve road safety. The movement has developed into a major standoff, and there have been scenes of violence in the streets of the capital, Dhaka, home to 18 million people. Here is how the story unfolded. What sparked the first protest? On 29 July, two schoolchildren in Dhaka - a boy and a girl - were run over and killed by a speeding bus. The driver is thought to have lost control of the vehicle while racing another bus to pick up passengers. The accident might have passed as an everyday occurrence in a city with notoriously dangerous traffic and in a country where more than 4,000 pedestrians were killed in road accidents last year. But instead, it first triggered widespread anger on social media and then led to a wave of student protests. Tens of thousands of schoolchildren took to the streets of Dhaka, blocking roads and intersections, leading to deadlock in the city. The protesters stopped trucks, buses and cars, demanding to see the licenses of drivers and check if vehicles were in roadworthy conditions. "All we want is corruption to be gone and driving licences to stop being handed out like candy," one 17-year-old told the BBC. How did things turn violent? 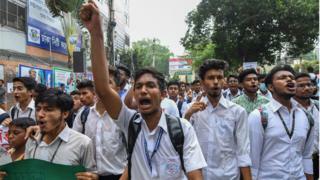 The protests, rare for Bangladesh, continued for days with thousands of pupils and students essentially bringing the capital to a standstill. Bus services in the city and on routes to elsewhere in the country were cancelled. Since Saturday, police have reportedly used tear gas and rubber bullets, injuring scores of the teenagers - although the authorities initially denied this. 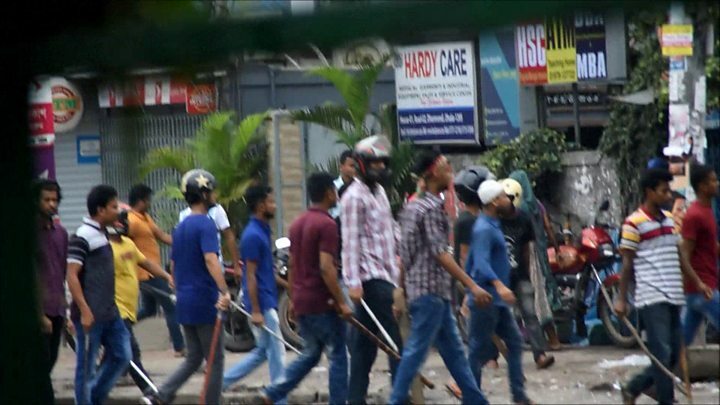 There also have been clashes between the protesters and pro-government groups, reportedly members of the Bangladesh Chhatra League (BCL), a student organisation linked to the ruling Awami League party. On Monday, violence continued as police clashed with university students on campuses and in residential areas. A doctor at a local hospital told newspaper The Daily Star that at least 40 people, mostly students, were being treated. The BCL have also been blamed for attacks on journalists - including the destruction of phones and cameras - which the Daily Star, in an editorial, called a "reprehensible violation" of press freedom. A number of journalists have reported being beaten while covering the protests, including a photojournalist for the Associated Press. A female reporter said she was threatened and physically assaulted by a mob of alleged BCL men, even after agreeing to delete footage she had recorded of them. "They kept saying that if they found I didn't delete it, 'you're done... no-one can save you'," the woman told the BBC, wishing to remain anonymous. "There's now fear that those speaking to international media are being targeted." Prominent activist and renowned photographer Shahidul Alam was charged on Monday with spreading propaganda and false information on social media after commenting on the protests on Facebook. His detention came hours after he had strongly criticised the government's handling of the demonstrations in a television interview with Al Jazeera. Rights group Amnesty International called for his immediate release and a stop to the government's "violent crackdown" on "overwhelmingly peaceful student protesters". Amid the violence, armed men attacked a convoy of cars carrying the US ambassador on Saturday night. How have the students organised themselves? With the protest movement almost entirely driven by young people, its unsurprising that social media has played a key role, in both spreading the initial news about the two killed as well as in organising the demonstrations. Users are widely expressing their shock and disbelief at the heavy-handed response but insist they will continue taking to the streets. Activists have also taken to social media in droves to call on local and international media organisations to cover the story. The government has promised to consider road safety reforms to address the students' concerns and on Monday the cabinet approved a new Road Transport Act that has been in the pipeline for some time. It is also reportedly considering the death penalty for deliberate road deaths in a bid to appease protesters. But officials have made it clear they want the protests - which have embarrassed the government of Sheikh Hasina - to end immediately. The government blocked 3G and 4G internet services for a period on Saturday evening - disrupting protesters' efforts to organise and share their actions. Ms Hasina on Sunday urged the students to go home. Her Awami League party has also defended the actions of party activists accused of violence. "Will we kiss them if they advance towards Awami League office?" general secretary Obaidul Quader said. The United Nations said it was concerned for the safety of the young people caught up in the protests. "We are deeply concerned about the reports of violence and call on all for calm," the UN resident coordinator Bangladesh Mia Seppo said. The US embassy in Bangladesh has also criticised the police response to the protests in a strongly-worded statement.